We are back in Red Lodge, but not with a bookstore. Phoenix Pearl Tea is our tea and game business on Broadway, right next door to where Red Lodge Books and Tea was located. Come see us, or order your favorite teas online! The bookstore Kathy and I purchased in 2001 is closing. For the first time in thirty years, the town of Red Lodge will be without a bookstore. I feel sad and guilty about it, but I also feel giddy and excited about what’s coming. If ever there was a personification of “mixed emotions,” it’s me. Right now. A group about an hour away in Billings has purchased all of the assets of Red Lodge Books & Tea and hired me to be the General Manager and create a new store for them. When we bought our store from my friend Randy Tracy, it was a small store smack in the middle of downtown Red Lodge, Montana, right across the street from the iconic Red Lodge Café. It was called the Broadway Bookstore, although I changed the name when I discovered that (a) Broadway Books is trademarked by Random House, and (b) there was an “adult” bookstore called Broadway Books & Videos just an hour away. When I took over the store, it was mostly used books, and the new books were predominantly local history and guidebooks. Over the next few years, we shifted the focus to be more about new books, finally eliminating the used books entirely when the library a few blocks away started doing monthly used book sales (it’s hard to compete with 25 cent books). We tried many experiments, some of which succeeded wildly (like our tea bar), and some of which flopped horribly (like greeting cards). The store has been a family affair. I’ve been there full-time and Kathy’s been there part-time for as long as we’ve owned it. Both of our kids have worked at the store (one is still there, as the Tea Bar Manager). When we were publishing the Red Lodge Local Rag, the office was in the back of the bookstore. 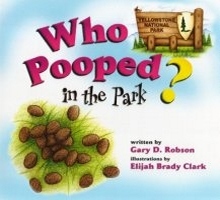 When the Local Rag book came out last winter, it launched at the bookstore. Our grandson is as comfortable in the store as he is at our house. Perhaps the greatest thing about the fifteen years we’ve spent running Red Lodge Books & Tea is the people we’ve gotten to meet. The book trade is simply filled with great people, and most of them are eager to share what they know. 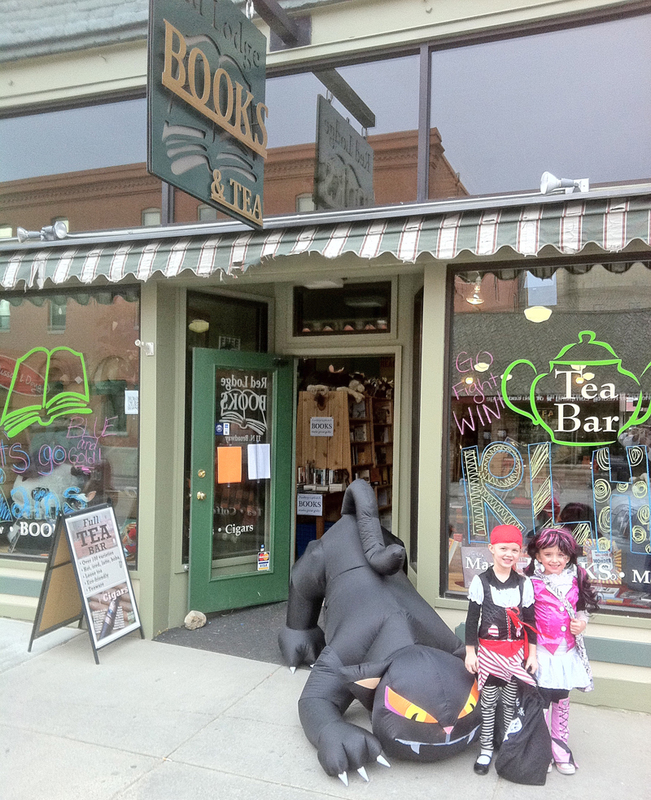 I’ve learned from other bookstores in Montana, like Chapter One, Fact & Fiction, Country Bookshelf, Montana Book & Toy Company, Thomas Books, Vargo’s Books & Jazz, and Barjon’s Books. I’ve met bookstore owners and booksellers at book conferences all over the West, and they’ve been helpful and friendly. And then there are the authors. We’ve had self-published local authors and New York Times bestselling authors, locals and authors from thousands of miles away. We’ve had events where nobody showed up, events so big we had to move them to the library, and events even bigger than that which we had to hold at the Elks. We’ve had events with police protection, parties with free beer & wine, cookbook signings with free food, and midnight Harry Potter parties with lines out the door and down the sidewalk. You want to know where I got a lot of the material for my new book about book signings? Right here! The toughest part of this whole deal is my feelings that I’m abandoning Red Lodge. For almost fifteen years, Kathy & I have been active parts of the community. Between us, we’ve served on the boards of the Chamber of Commerce, Downtown Merchants Association, Yellowstone Wildlife Sanctuary, Red Lodge Festival of Nations, Convention & Visitors Bureau, Red Lodge Proud & Beautiful, and Beartooth Elks Lodge. We’ve worked on City committees, the Red Lodge Branding Initiative, and the Christmas Stroll. We’ve sponsored events all over town, and I’ve emceed events all over town. But most of all, we’ve given Red Lodge a place to buy books, hang out with other book lovers, meet authors, and have a great cup of tea. I’m going to miss that. Kathy’s staying active in many of those downtown groups, but for the next year while I’m getting that co-op up and running in Billings, I won’t be able to. I’m not moving, but I’m not quite staying here, either. Closing Red Lodge Books & Tea is, indeed, the end of an era. It’s been a good era. And I think the new era is going to be a good one, too. We’ll never be able to fill the gap that Susan Thomas left behind when she retired and closed up Thomas Books, but we’ll do our best to build a thriving bookstore and literary hub right in the middle of downtown Billings. It’s a big challenge, and I’m looking forward to it. 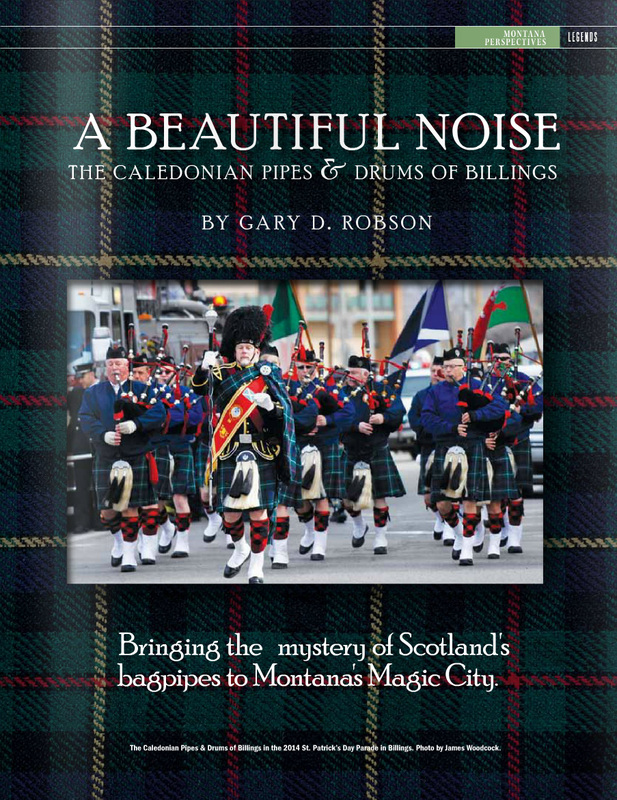 The Billings Caledonian Pipes and Drums – Bagpipes in Montana! The following is an article that I wrote for Magic City Magazine. It appears starting on page 39 of the March 2015 issue. Please visit their website, or if you live in the Billings, Montana area, pick up a copy of the magazine. It’s well worth the read! And if you’re interested in Scottish culture and kilts, you may want to peek at two of my other posts: The History of the Kilt and Kilts vs. Lederhosen. To see the article as it appeared in the magazine, including photos, you can scroll to the end of this post and click on the thumbnail pictures. One musical instrument has a dedicated word to describe its sound (“skirling”). One “instrument of war” caused a musician to be executed for treason just for playing it. One instrument is so iconic that it can call a specific country to mind by playing a single note. That instrument is the Scottish bagpipes. You don’t have to head for the Highlands to hear the skirling of the pipes, though. Although the sound of bagpipes echoing through Scotland’s misty moors in the gloaming is an experience you’ll never forget, you can hear that same sound much closer to home. The Billings Caledonian Pipes & Drums practice every Wednesday night at Billings West High School and offer free lessons in piping and drumming to anyone who is interested. Despite being an icon of Scotland, the origin of this unique instrument may go back much farther. 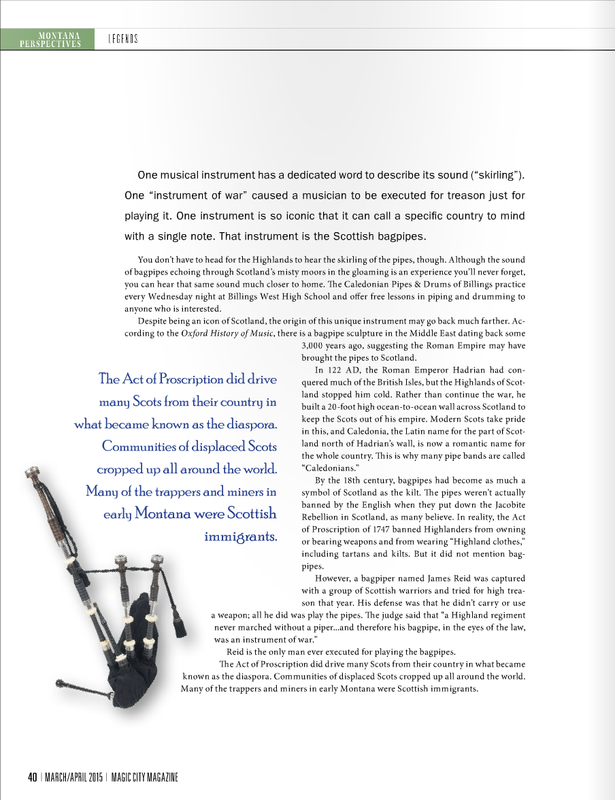 According to the Oxford History of Music, there is a bagpipe sculpture in the middle east from over 3,000 years ago, and it may have been the Roman empire that brought the pipes to Scotland. By the 18th century, bagpipes had become as much a symbol of Scotland as the kilt. The pipes weren’t actually banned by the English when they put down the Jacobite Rebellion in Scotland, as many believe. In reality, the Act of Proscription of 1747 banned Highlanders from owning or bearing weapons, and from wearing “Highland clothes,” including tartans and kilts. But it did not mention bagpipes. Reid became the only man ever executed for playing the bagpipes. The Act of Proscription did drive many Scots from their country in what became known as the diaspora. Communities of displaced Scots cropped up all around the world. Many of the trappers and miners in early Montana were Scottish immigrants. Bill Flockhart was one of the young men who left the shores of Caledonia in 1904 to seek a new life here. He found work in the mines around Red Lodge and became a part of the burgeoning Scottish community. After a time, Flockhart became concerned that new generations were losing interest in bagpipes. He took it upon himself to rectify that situation and began teaching anyone willing to learn. 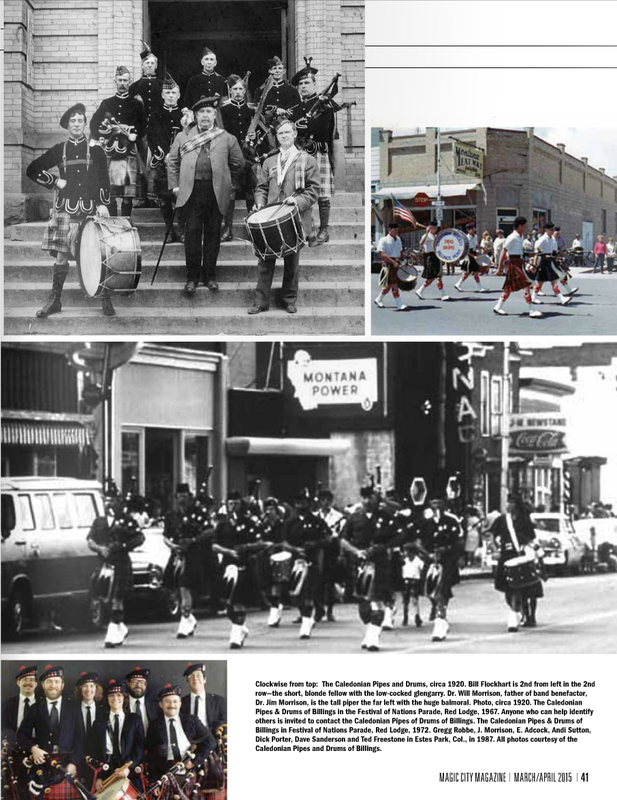 In 1963, a group of Flockhart’s students formed the Billings Caledonian Pipes & Drums. “No, I never intended on being the pipe major. I have more fun just piping,” he said with a laugh. The band has had a number of pipe majors since, and Donell Small took over the position in 2003. Growth has been steady since that point, and the band now has 20 pipers, 5 pipe students, and 8 drummers. “I got involved with the Caledonians in 1984,” Small says. “I had wanted to learn to play for a long time, having two Scottish grandmothers, but never got around to it.” One day, he just walked into a music store and asked them how he could learn to play bagpipes. They had no idea where to get bagpipes, but guided him to pipe major Jim Morrison (another of Flockhart’s students). Small showed up at the next practice and has been there ever since. Bagpipes don’t exist in a vacuum, though. The band is, after all, the Caledonian Pipes & Drums. As much as the pipe major works behind the scenes to bring everything together, the drum major acts as the public face of the band, leading either with his drum or with an ornate baton known as the mace. 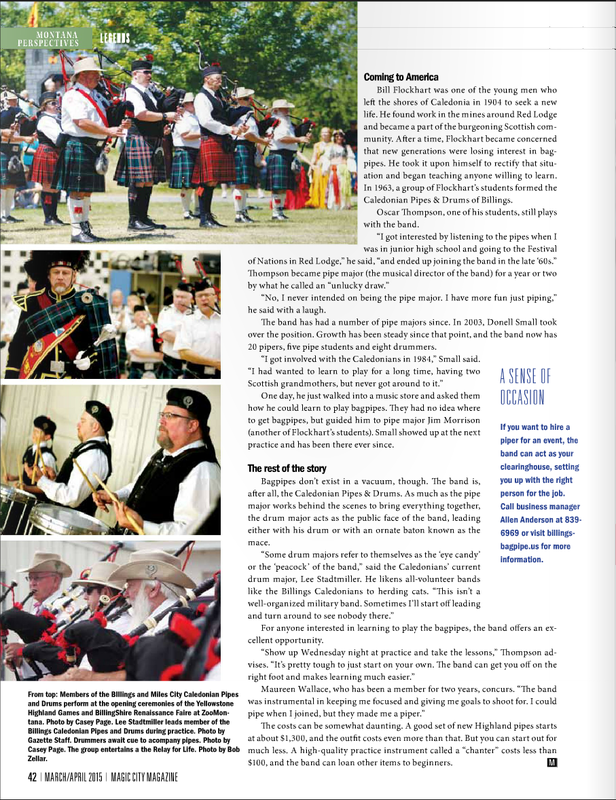 If you are interested in learning the bagpipes, the band offers an excellent opportunity. The costs can be somewhat daunting. A good set of new Highland pipes starts at about $1,300, and the outfit costs even more than that. But you can start out for much less. A high-quality practice instrument called a “chanter” costs under $100, and the band can loan you most of the rest when you’re starting out. The American Booksellers Association Winter Institute last month in Seattle was all about sharing and education. Sometimes sharing ideas is enough to create new ideas along the way, and that’s just what happened to me. I attended some wonderful sessions about merchandizing and decorating, and when I was telling someone about it later, I wished I had copies of all of the slides I had seen. Creating Compelling In-Store Displays was a panel featuring Arielle Eckstut and Joann Eckstut, authors of The Secret Language of Color; and Jonah Zimiles of [words] Bookstore in Maplewood, NJ. In this fascinating discussion of color and theme, they showed a variety of displays, store windows, tables, and fixtures, including some amazingly inexpensive and quick ideas that were still professional and eye-catching. Gifts 101 wasn’t really about merchandizing, but panelists Linda Marie Barrett (Malaprop’s Bookstore & Café), Monica Holmes (Hicklebee’s Children’s Bookstore), and Jan Hall (Partners Village Store) showed a lot of pictures, including tables and racks that meshed books and gift items. Identify and Cultivate Your Store Brand was all about making the look and feel — the “experience” — of your store together. Like the gifts session, its focus wasn’t merchandizing, but there were some amazing ideas. The panelists represented a diverse collection of bookstores. Nicole Sullivan (BookBar Denver) showed an amazing bar made out of books, Bradley Graham (Politics & Prose) has displays bigger than some of the sections in my store, and James Adams (5ive Creative) talked about case studies where he’d helped bookstores with their branding. At the cocktail reception the last night of Winter Institute, I ran into Sydney Jarrard from the American Booksellers Association. Always eager to create more work for other people, I suggested to her that the ABA should create a Pinterest board where bookstores could share ideas for displays and window decorating. She enthusiastically agreed, talked to the boss, and dropped it back in my lap last week. I really have to work on saying “no” more often. I have now created not one, but two Pinterest group boards, one for in-store displays and one for windows. I started them with a few humble (very humble) pictures from my own store, and this blog post is the beginning of an effort to reach out to booksellers across the country (heck, around the world: I met book people from six countries at Winter Institute) and get everyone else sharing. To join in the process, visit the board(s) you are interested in and follow them. Then leave a comment here on this blog post using the same name you used on Pinterest. I’ll authorize you to pin, and you can start adding pictures from your own store. You do not have to be a member of the ABA to participate, but why on Earth would you have an indie bookstore and not want to join? They provide an awful lot of benefits for a very reasonable level of annual dues. Who could possibly sell cat books better than a cat? 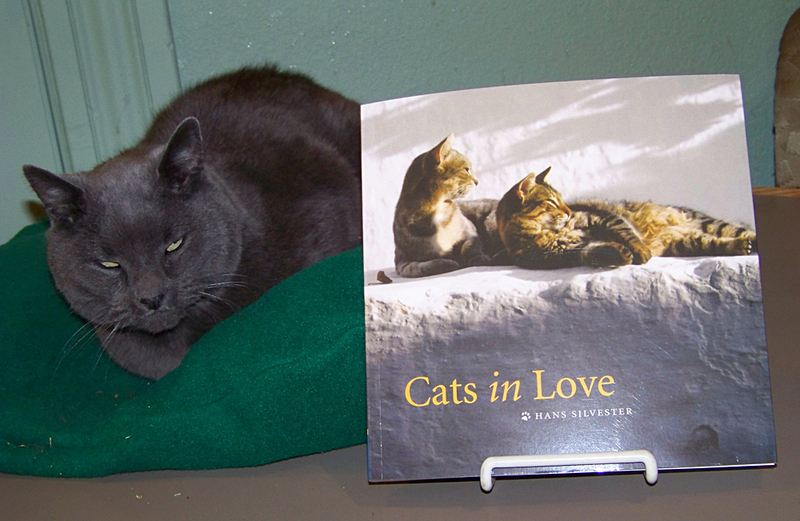 I put copies of various cat-related books next to our bookstore cat Benjamin’s bed, so he’d attract attention and people would pick up the books when they stopped to pet him. Red Lodge is right up against the Absaroka-Beartooth Wilderness near the northeast entrance to Yellowstone National Park. We are surrounded by millions of acres (literally) of wilderness areas and outdoor activities. 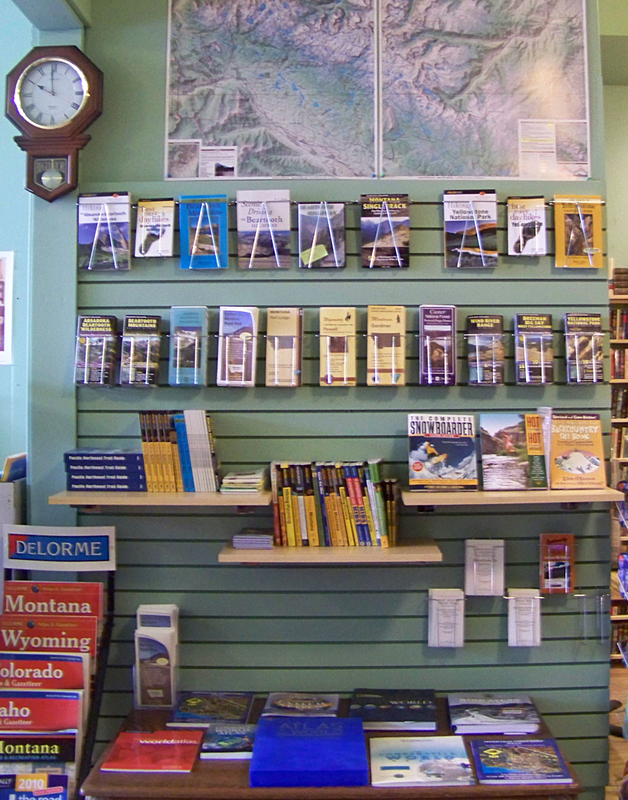 We decided to set up this display to keep the hiking guides, maps, atlases, and outdoor activity books all together. People coming in for a copy of Day Hikes in the Beartooth Mountains just might want to pick up a hiking map to go with it! When we first started selling computer books, we tried to come up with a good way to show them off. 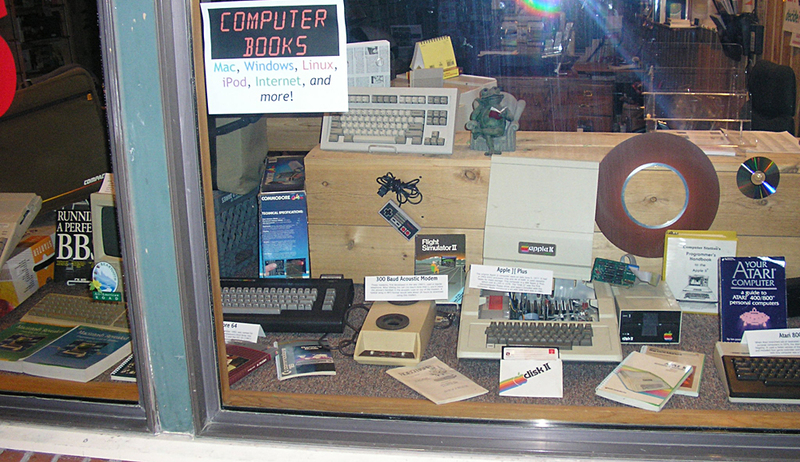 Being quite a packrat, I have saved up computers since I got my first one in the 1970s, and I built a mini-museum in the front window. People stopped to look at the old acoustic coupler modem and Apple ][, and ended up coming in to pick up a Mac or Windows book. Last Halloween, we decided to take the store right out onto the sidewalk. As you can see in the picture, the local high school had decorated the windows for the big game, and we put this inflatable black cat in front of the door, moving his head back and forth to watch people go by. You can’t always see into the store well due to glare on the windows, but you could sure see this fellow! There are a few of my pictures to get the ball rolling. Let’s see how many more we can get on here in the next month. Challenge issued. Challenge accepted?